Agent John Bishop works to protect the earth from alien invasion. He was introduced in Season 3’s Space Invaders/Worlds Collide multi-parter, where he kidnapped the Turtles and tried to dissect them in an attempt to learn the secrets behind their mutation. Since then, he has played a part in most of the series’ primary storylines, as both an enemy and ally to the Turtles. A U.S. soldier during the early 19th century, John Bishop’s life was changed forever when, for unknown reasons, he was abducted by Gray Aliens while fighting in the Battle of New Orleans. After being experimented on, he escapes back to/is returned to (the series is unclear on this point, leaving both possibilities open) the battlefield. What exactly the experiments entailed is unknown, although it is speculated that they are at least partly responsible for Bishop’s longevity and enhanced strength. Marked by the experience, he has since dedicated his life to staving off alien invasion (Though he knew Abraham Lincoln was an Utrom and thus he did not hunt Utroms in Lincoln’s memory). Little is known about the following one hundred and ninety years of Bishop’s life, except that he was present for the U.S. Army’s victory over the first alien invasion in United States territory and the subsequent creation of the black-ops Earth Protection Force during the Grant administration. He was also responsible for the Roswell incident of 1947, in reality caused by the a covert takedown of a flying saucer belonging to the Greys. (These could be the same Greys who experimented on Bishop, since the surviving alien they dragged out seems to recognized Bishop.) In more recent decades, he acted as Best Man to Finn, a Navy sailor who later on was turned into a mutant under unknown circumstances. During the 2003 Ninja Turtles series, Bishop acted as the head of the Earth Protection Force, a black-ops team formed to protect Earth from extraterrestrial threats. He applied an “any means necessary” approach to his mission, and was aiming to accumulate alien technology and use it to improve humanity’s gene stock and build an army of super-soldiers. Cunning, uncaring and manipulative, there was precious little that Bishop would not do to obtain what he wanted. During the Triceraton Invasion, he made a deal with the Federation, offering the Fugitoid, along with his knowledge of the world-destroying Teleportal, in exchange for weapons and technology, as well as a guarantee that Earth would be left untouched by other aliens. He also captured the Turtles and took samples of their DNA, as well as Leatherhead’s, whom he experimented on and thus unleashed his primal instincts. He was going to collect more DNA when Splinter, Casey Jones and April O’Neil stormed his lab. When he reached another one of his bases, Honeycutt’s message was interrupting his work and he ordered the transmission to be severed. Bishop set up a convenient trap for Karai, who was trying to steal an alien microchip and then called Oroku Saki to demand that he hand over all of the Triceraton tech he had been salvaging under the cover of rebuilding New York, threatening to kill Karai should he not respond in forty-five minutes. But Saki sent Hun to save Karai, who follows Bishop all over town. Bishop then decided to take down the brute once and for all, only for the Turtles to interfere, as he is the only person they hate more than Hun. Even fighting against the odds, Bishop resolved to abandon the train he was on and revealed to the Turtles of his taking of their DNA, which sped his work by decades. Bishop then began an elaborate plan to capture Splinter, whose DNA was more complex. He intended to copy that advance DNA to create an army of super solders (all in the image of him) born of enhanced DNA acquired from genetic manipulation, alien autopsies, and DNA stolen from the turtles. His first creation was the Slayer, a cyborg meant to hunt down aliens anywhere, who didn’t care if people got hurt in the process. But the Turtles and Honeycutt stormed the lab and managed to seal the Slayer in a tank. While fighting against Splinter, Bishop was sent slamming against a hook but he apparently survived and escaped the flooding facility while no one was looking. At Oroku Saki’s “good-bye party”, Bishop had a contact on the inside — Dr. Baxter Stockman, who had grown tired of the Shredder’s punishments. He learned that Saki had been constructing a ship to return to the stars. Bishop had his men blow the main launch tunnel, forcing Saki to go through the doors of the party going on beneath. Bishop had any surveillance station launch missiles at the ship, determined not to allow the ship to escape. The ship was destroyed, which was a relief to Stockman, as Bishop says it’s the beginning of a “beneficial partnership”. Unfortunately, the E.P.F. was under fire from the President of the United States for attacking the Saki estate. The President warns Bishop should there be anymore failures, he would cut the E.P.F.’s funding. Immediately after, Bishop learns that Finn had been stolen by the Purple Dragons and was determined to retrieve the mutant at all costs. He chased Finn to his wife’s house, remarking that he still remembers. Unfortunately, Bishop fails to recapture the mutant and presuming him dead in a fire. This further failure was enough to the bureaucrats were going to shut the E.P.F. down. Bishop staged an alien invasion for him to stop, “proving” his organization’s worth and assuring his funding. With one ship in the sky, remote controlled faux aliens and a number of holograms, they made it seem like Earth was being invaded again. Bishop “saved” the President, as well as placing the Turtles as most wanted on alien hit list. Unfortunately, the alien residue accidentally came in contact with local wildlife and mutated them into a savage, near-sentient form. Bishop had to focus the E.P.F.’s resources on containing the outbreak but there was no end to it. Bishop demanded that Stockman clean up his mess, but his head scientist was too focused on creating his own body. But it proved to be a failure after a series of hallucinations and decompositions. Stockman seemingly died in Hudson river, but Bishop simply resurrected him, claiming that he was far too important to his work. The Turtles (excluding Don who was infected) demanded they give a cure. Bishop agreed, having Stockman work with Leatherhead, while he had them retrieve the Heart of Tengu, which he heard from a mysterious contact that it was an archive of alien technologies. Once they got it to him, he had Area 51 self-destruct to cover its existence (though they all left before that) and had the cure spread all over New York. But when they use lasers to try to crack the Heart, it shattered, as the entity cut off communications. What Bishop didn’t known was that the entity was the Water Foot Mystic, who was manipulating everyone so that Karai’s control over them will be broken. Stockman recovered a number of nanobots from a Triceraton wreck at Coney Island, which they presumed to be a new alien technology, not knowing it is a government project. Stockman places a microchip on one of the nanobots, activating them to serve Bishop’s commands. Unfortunately, they found out that the nanos were intelligent and that its original programming was fighting with Stockmans and gathered all advanced technologies as it escaped, underlining Stockman’s overconfidence once more to Bishop. Bishop, Stockman and the rest of the E.P.F. troops were part of the final attack on the Tengu Shredder at the Turtles’ side. One of the few characters known to have survived the intervening 100 years between the series’ present day and 2105, Bishop is a recurring character in TMNT: Fast Forward. his approach to Earth defense. Now the very popular President of the Pan-Galactic Alliance (described as a intergalactic version of the United Nations but in reality it an intergalactic verson of the United States Of America, which Bishop helped form), he now used diplomacy to maintain inter-planetary peace. Now a public figure and – due to the neutrality status of the P.G.A. – incapable of directly taking part in missions (although in latter episodes this attitude was slightly slackened), Bishop recruited the Turtles to covertly stop famed mercenary Torbin Zixx from completing a sabotage mission on Earth. Later on, the episode “Head of State” revealed the reasons behind Bishop’s change of heart. Roughly fifty years prior to 2105, he and Baxter Stockman, both still working for the E.P.F., finally realized Bishop’s ambition of a super-soldier army in the form of what Stockman named “Organic Mousers”: biped one eyed dinosaur like creatures able to withstand heavy damage and controlled by sound. A lab accident seemingly killed Stockman; Bishop himself would have died if not for the actions of one of the E.P.F.’s alien test subjects, who saved his life. Surprised and touched than an alien which had been tortured and experimented upon by the E.P.F. still had enough mercy in it to save him, Bishop’s viewpoint on aliens changed radically, and he turned his efforts into befriending them instead, leading to the creation of the Pan-Galactic Alliance. It was this change of heart that saved him when he was kidnapped by the still-living Baxter Stockman, who, seething at Bishop’s abandonment fifty years ago and still incapable of building himself a new body, wished to take Bishop’s body as his own; but convinced by Leonardo that the world Bishop helped create was one where even he could live a normal life, he abandonws his plan. Immediately afterward, as the abandoned E.P.F. base where Stockman had taken Bishop was destroyed by Stockman’s organic mousers, Stockman was once again placed in mortal peril. This time, however, Bishop did not hesitate and managed to save his friend’s life. 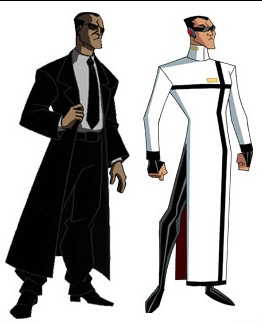 Finally, Bishop appeared in the episode “Day Of Awakening”, where he informed the Turtles about Sh’Okanabo’s takeover of the lunar settlement Moonbase Bishop, recruited them in his attempt to stop the alien, and provided them with the weaponry that eventually killed him. Bishop appears in “Wedding Bells and Bytes”, watching Casey and April’s wedding from a monitor. He also manage to become leader of earth by the 2050’s and made EPF the earth military this was done by sabotage discrediting and extortion, blackmail and others and for military the same and the expanded to other operations counter terrorism,mystical threats special force operations and foreign intervention, special forces operations and others. While the source of his physical prowess is debatable, Bishop possesses speed and agility that borders on inhuman, allowing him to avoid most danger to his person. He is an accomplished martial artist, able to hold his own even when fighting all four of the Turtles simultaneously, as well as Hun and Karai. He is also able to quickly defeat and with ease the Shredder’s Elite Guard and beat Splinter one-on-one. In battle, his unique fighting-style is mostly defensive, allows him to adept to seemingly any situation and use any item of the very battlefield to his advantage. He also possesses super-human endurance and recovery, as evidenced in “Bishop’s Gambit”, when he was impaled on a hook, yet survived with no permanent damage. Despite his physical abilities, his body seems to suffer from an unknown condition that causes it to gradually break down. He has survived throughout the centuries thanks in part to a succession of a one or two clone bodies. His most recent body, made by Baxter Stockman, seems to have freed Bishop of his body breakdown problem. Whether or not his clone bodies are the reason for his continued survival is, as of yet, unknown.he also manage to unify earth thanks to espionage discrediting allying sabotage and others and made the EPF the earth military by doing counter terrorism work mystical defense and special operations and others. A government agent addressed as “John” by Razorback in Tales vol. 2 #61, according to Tristan Huw Jones, was intended to be John Bishop, but the opportunity to follow up on this plot thread was not possible.